Tuesday night, Richard Hambleton died. Most people outside of the art world are unfamiliar with him, but as a contemporary and colleague of Jean-MichelBasquiat and Keith Haring he was a pillar of 1970’s street art. The obituaries and articles about him are arriving. Bedford-Bowery, Art-Forum, Artnet His life was as troubled, tormented and precarious as anyone’s in the art world ever was. Ironically, he has 3 works on display right now at the Club 57 exhibit at MOMA. I can’t say he was my friend, but I certainly knew him. I was introduced to him by my close friends the Woodwards who represented him at their gallery and protected him. I was asked if I might get him some help. His face had been terribly eroded by a skin cancer that he failed to allow anyone to treat, although he had been offered help on countless occasions. 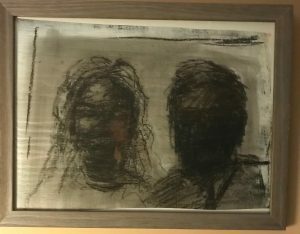 What I can say is that he asked to do a shadow portrait of myself and my wife. He worked at it from photographs we supplied him. It took him months to complete, but it was ready at Christmas. He told me the lines on either side were recalling Ad Reinhardt. He said what took him so long was capturing Anne’s hair and that he had only done one other shadow painting with someone with glasses. He cut his sketch from his wallpaper and gave it to me. His life struggles with addiction, fame, disease and self destruction was recently documented in a film by Oren Jacoby at the Tribeca Film Festival, Shadowman. Ironically once again, the film is soon to be more widely released and will memorialize a truly tragic life of a major creative force in an unbelievably tormented man. As I’ve told in my book Life on the Thin Blue Line Art History has always been a part of my life, since my early days at Cornell. Seeing life through eyes so different from my own has continually allowed me to broaden my outlook and perspectives. I am pleased that I had the opportunity to know Richard and hope that somehow he has found some peace. Thank you for that article. 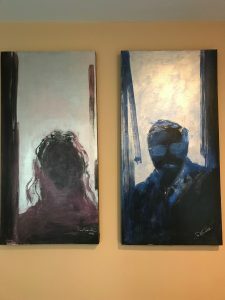 You are most welcome…I commissioned portraits of myself and my wife which your brother provided. We are saddened by his loss and know the world has lost a truly dynamic force.